Your landscape is an asset. What are you doing this season to enhance your commercial property’s curb appeal and maintain its quality, health and overall appearance? Spring color can accomplish these goals and gives your property a noticeable, differentiating “pop” that will take you from spring well into summer and beyond, if you select the right plants. a healthy, sustainable landscape that stays relevant. 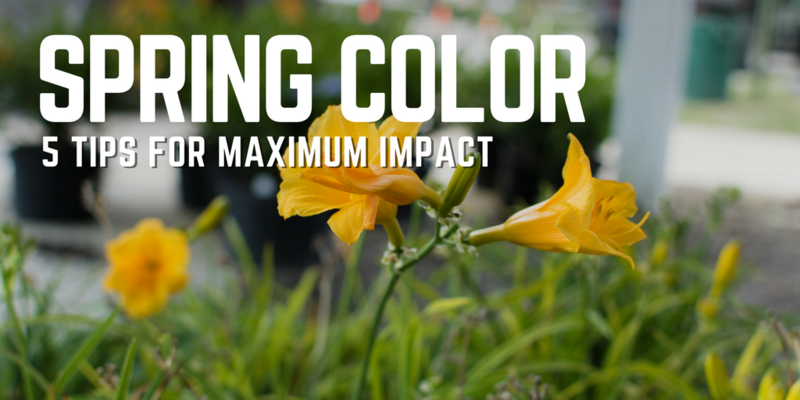 Here are some strategies for selecting spring color that maximizes your property value and budget. Annual color keeps beds looking fresh and provides an opportunity to include some of the latest flower introductions and colors into the landscape. But, as their name implies, annuals last for the season and must be replanted the following year. 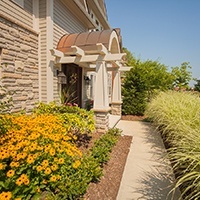 Annual flowers are a yearly expense for property managers—however, there’s a way to strike a balance and maximize your budget while keeping the landscape relevant. By mixing annual and perennial flowers in landscape beds, you’ll have a variety of plants that return each season and some that will be replaced annually to keep beds interesting. 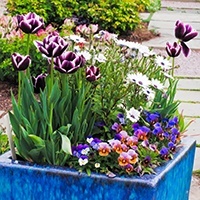 Container planters provide flexibility and are incredibly versatile because they can be physically moved and replanted seasonally to update the look. Because containers hold less volume than an entire landscape bed, they are an effective way to include spring color on your commercial property while maintaining a budget. To get the most impact from annual color, choose plants with showy foliage so when blooms are expired, there’s still interest from attractive leaves. 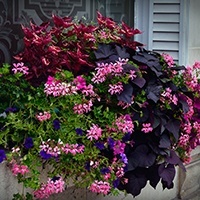 For example, plants with burgundy foliage and pink blooms provide persistent color. Also consider flowers with evolving color, like the Itea with eye-catching blooms white and green foliage that turns scarlet in the fall. Concentrate color in high-impact spaces such as by property entrances, signage and building doorways. Maintaining these focal points on your property is important for the overall “branding” of your property. These areas are the first-impression places on your property, so they deserve a greater investment—including seasonal color. Want a sustainable alternative to annual flowers? 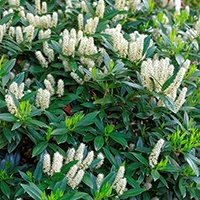 How about shrubs that are low-impact and add color to the landscape? Knockout roses are known for their continuous, vibrant blooms and are available in a range of hues: red, pink, white, yellow and beyond. Spilled Wine® Weigela grows wide rather than tall, and has deep-purple foliage and pink flowers. 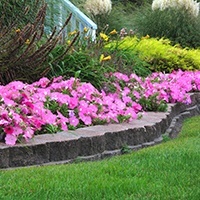 Because of its low-profile spreading behavior, it covers landscape beds and borders nicely. Itea (Sweetspire) grows in sun or shade, has fragrant, spike-like flowers and interesting foliage that turns deep red in fall. There are several varieties of Itea. Depending on the selection, plants will grow to 3- by 5-feet tall and wide to 8 by 10 feet. Spring is officially here, and at Schill Grounds Management we are scheduling spring cleanup and planning for additional services that elevate the value, beauty and sustainability of your property. That includes mulch, annual flowers, flight control (keep those geese away!) and irrigation audits. We’re also addressing drainage issues with stormwater solutions before we head into the wet season. The reason we emphasize these spring services? Because part of our C.A.R.E. commitment is to serve as a partner that’s constantly looking for ways to enhance the value of your commercial property. That means delivering Consistency, Accessibility, Reliability and Expertise through the seasons. Have a question about how landscape services are priced? Download our free e-book. And, give us a call any time—we want to hear from you. Dial 440.327.3030, or fill out this simple contact form and we’ll get in touch with you.